Banff & Buchan MSP Stewart Stevenson has called upon groups across Banff & Buchan to apply for a share of £60 million that has been put in place to regenerate Scotland’s high streets. A wide range of bodies including local authorities, Community Planning Partnerships, business Improvement Districts, Town Centre Managers, local Chambers of Commerce, businesses and third sector groups are eligible to apply. There will be two opportunities to submit applications for consideration. The first deadline date is June 1, 2009 with decisions on applications expected by the end of July. A second assessment round for applications received after June 1 and before August 21 will also take place. Results of this round should be known in October 2009. “I am delighted that the Scottish Government’s Town Centre Regeneration Fund is now open for applications. In these difficult economic times, the fund has the potential to make a real difference to Banff & Buchan’s high streets, the beating hearts of our towns. “I hope that the fund will receive a wide range of bids from local groups in Banff & Buchan and that this money will help secure the economic futures of our towns. “With schemes like this and the small business bonus, the Scottish Government is working hard to help our communities cope with the economic problems that they currently face. Our high streets and the small businesses on them are vital to local economies and we are determined to give them all the support we can during these difficult times”. Young people across Scotland are being targeted in a new road safety drive which seeks to capitalise on the popularity of social media sites such as Bebo and Facebook to save lives. The ‘Your Call’ initiative, which has been developed by Road Safety Scotland, was launched today by Transport Minister Stewart Stevenson and former Scottish rugby internationalist Gavin Hastings. The new DVD resource for schools uses social networking imagery to engage pupils and shows the harrowing effect road accidents can have on young lives. Today’s announcement is the latest initiative to use cutting edge technology to broadcast road safety messages, and follows on from successful Scottish Government initiatives using the Xbox and mobile phones. “While road accidents are at their lowest for 50 years, too many young people are still dying on our roads. “As a Government we are constantly looking at ways to target this group and I am determined that we look beyond the traditional and towards the innovative in our efforts to save lives. “This is a great new campaign which uses the popularity of sites like Bebo and Facebook to help us engage with young people. I am confident it will be a real success. “Our research suggests that young people are more responsive to road safety messages which utilise the latest in technogy and we have already used the X-box and mobile phone technology to transmit our messages. “Most 11-14 year olds are familiar with social networking sites like Bebo and this new approach will help further reach this important group. "As we move towards the publication of our new 10 year road safety strategy for Scotland we will continue to look at what more we can all do to improve road safety across the country." Banff & Buchan MSP Stewart Stevenson has welcomed the Scottish Government’s plans to give skippers the choice of how to apply for days at sea, with the increased flexibility this will bring. The Scottish Government has been working with the industry to come up with the most effective means of allocating days at sea allocations following changes to EU regulations that mean national governments now receive a set amount of days at sea which they may then allocate to their fishing fleets. Skippers will now be able to decide whether to apply using the rate-per-vessel-type system that has previously been in operation or alternatively they can apply based upon their historic track record. They will then be able to apply for additional days at sea, under the Scottish Government’s pioneering Conservation Credits Scheme. “Although these are difficult times for Banff & Buchan’s fishing community, I welcome the fact that the Scottish Government has decided to offer skippers an increased level of flexibility in applying for their allocation of days at sea. “The SNP Government is working closely with the fishing industry to try and make the best of a difficult situation and help our industry to be as profitable and sustainable as it can be under current restraints. The Conservation Credits Scheme which successfully convinced the EU not to cut the available days at sea is a clear example of this. “However, as the European Commission has itself acknowledged, the Common Fisheries Policy is fundamentally flawed and needs to be completely replaced with a system that returns control to national governments. Working together, the Scottish Government and Scotland’s fishing industry have a far greater chance of developing a profitable, sustainable industry than the EU’s centralised decision making. “A system where land-locked countries have a greater say on our fishing policy than Scotland does cannot continue, and the SNP will be pushing hard for an end to this ludicrous situation”. Banff & Buchan MSP Stewart Stevenson has welcomed Scottish Government proposals to radically reform existing Right to Buy legislation, in order to tackle chronic social housing shortages across Scotland. By ending the Right to Buy on new build council houses, it is estimated that between 10,000 and 18,000 homes that would otherwise be sold between 2012 and 2022 can be kept in council ownership. “After many years of failure by Labour and the Conservatives to address severe problems in social housing availability, I am delighted that the SNP Government is tackling the issue head on. “In the four years before the SNP entered Government there were just 6 council houses built across Scotland, a totally inadequate response to the problems faced by many people in Banff & Buchan and across Scotland. That is why I welcome the fact that the Scottish Government has recently committed £50 million to kick-start a new generation of council house building to begin addressing this issue. Three major construction contracts amounting to £100 million have been awarded today to improve rail infrastructure in Scotland. The contracts are part of £300 million of Scottish Government investment to deliver the new Airdrie-Bathgate Rail link. Transport Minister Stewart Stevenson said that the contracts, awarded by Network Rail to Carillion, BAM Nuttall and C Spencer, would be a 'real boost' to the construction industry and deliver major rail improvements for Scotland. Carillion has been awarded an £80 million contract to build new stations at Caldercruix, Armadale and Drumgelloch and a range of other new structures and earthworks. The company will also carry out ground treatment and filling operations BAM Nuttall will deliver the new station at Bathgate, the new platform at Airdrie and a range of bridge works and earthworks in a £14 million contract C Spencer has been awarded a £6 million contract to build the new light maintenance depot in Bathgate. "These contracts will be a real boost to the construction industry and will deliver major rail improvements for Scotland. "I am delighted to see the progress today - a key element of our transport investment programme with Transport Scotland and Network Rail. "We'll see new stations, new platforms, maintenance depots and structural work, all part of a total investment of £300 million to deliver the new Airdrie-Bathgate Rail link. "Once complete, the new line will bring real improvements for passengers, creating a fourth route between our two largest cities which will open up further economic and social benefits for communities across the central belt. "The Scottish Government is working hard to support businesses through the downturn, and today's announcement is evidence of how our continuing investment is helping the hard pressed construction sector now. Our £3.5 billion annual capital investment programme is supporting approximately 50,000 jobs in the Scottish economy. "These major contracts will allow the rail industry to get down to business in delivering the Airdrie-Bathgate project." "Strategically and economically, the Airdrie-Bathgate Rail Project is vital for the continuing development of Scotland's public transport network, providing enhanced accessibility and mobility to a growing population in the Central Belt and creating an additional rail link between the country's two largest cities. "The awarding of these contracts marks a major step in the delivery of this project and we look forward to working with Carillion, BAM Nuttall and C Spencer to create a first-class route and facilities for the travelling public." The three companies will begin work this spring and all works will be completed by autumn 2010 ahead of the reopening of the railway in December 2010. Funded by Transport Scotland, the £300m rail link will provide an additional passenger route through the central belt between Edinburgh and Glasgow, with four trains each hour in each direction. Once complete, the investment will create a fourth route between our two largest cities adding to the three current routes: the Edinburgh to Glasgow main line, Glasgow to Edinburgh via Carstairs, Glasgow to Edinburgh via Shotts. The electrified railway will also connect communities not currently served by rail to the country's two main cities and improve access to employment, education, health and leisure opportunities as well as promoting a sustainable alternative to the car. 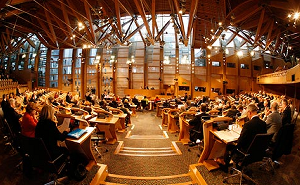 Scotland must take innovative action to adapt to the impacts of climate change, Stewart Stevenson said today. The Minister was speaking as he launched the second stage of the consultation on Scotland’s new Climate Change Adaptation Framework which looks at how Scotland should plan for the unavoidable consequences of climate change. “Scotland’s climate is changing. While urgent action to reduce emissions is vital, so is action to reduce Scotland's vulnerability to the impact of our already changing climate. Some degree of climate change is unavoidable, as the impacts over the next 30 to 40 years have been determined by our past and present emissions. We cannot prevent these, but we can adapt. “Therefore, alongside cutting emissions, Scotland needs to find ways to adapt to a new and challenging climate. By planning and preparing for change now, Scotland will be better placed to take advantage of any opportunities and build its resilience to any potential negative consequences change brings. “This isn’t just a green issue. Climate change will have real impact on our economy; it will have a real impact on people. Our whisky industry is showing real leadership in its response to climate change and are an example for other sectors to follow. Scotland must be fully connected to any UK high speed rail network, Transport Minister Stewart Stevenson said today. The Minister was speaking ahead of his meeting with UK Rail Minister Lord Adonis. "There is no doubt that a high speed rail link connecting Scotland, London and Europe would bring significant economic and environmental benefits. "Improved journey times could provide significant benefits to Scotland's economy, improving connections and opening up new opportunities. Shorter journeys could also drive a real travel shift from air to rail and significantly reduce our emissions. "Lord Adonis recently asked High Speed 2 (HS2) to examine the potential for expanding high speed services to Scotland and I will ensure Scotland's voice is heard in this work. It is important HS2 works up a fully developed case for a high speed rail project that links Scotland to the major capitals of Europe. "While we support High Speed links to Edinburgh and Glasgow it is vital these connect effectively to our existing network so that all parts of the country can enjoy the benefits." Banff & Buchan MSP Stewart Stevenson has hit out at the previous failure of the Treasury to offer adequate support to developing Carbon Capture and Storage (CCS) technology in Peterhead. The Chancellor today (Wednesday) announced plans for an incentive scheme to support the development of CCS technology, yet the Treasury’s failure to support this kind of technological development 2 years ago led to a proposed project in Peterhead being transferred to Abu Dhabi. “The Treasury’s change of heart over Carbon Capture technology only serves to demonstrate how dearly their dithering and incompetence has cost Peterhead. While Peterhead could have been leading the world in developing this vital technology, the Treasury instead decided to torpedo the plans two years ago. “Although I welcome the fact that they have now recognised the potential importance of CCS technology in the fight against climate change, I know that there will be a deep degree of anger in Peterhead over their change in position. If it is right to support the development of carbon capture through an incentive scheme now, why was it not right two years ago? “The Chancellor owes the people of Peterhead an apology for the mixed signals and previous lack of support from his department. Their previous failure has caused serious damage to Peterhead and the fight against climate change more generally”. "This is too little, too late from the UK Government. Local MP Alex Salmond urged successive Energy Ministers to act to secure this project for Buchan but London chose instead to squander the opportunity. Up to 40 new jobs are to be created following significant investment to expand the Shields Road train depot in Glasgow, Transport Minister, Stewart Stevenson MSP announced today. £24m has been made available by Transport Scotland to enable construction works to begin early next month on a new purpose-built train maintenance and overhaul facility. The depot which is expected to be completed by the end of August next year, will house and maintain a new fleet of 38 electric trains as well as some of the existing Scotrail fleet. The 130 rail carriages are due to start coming into service from September 2010 - a fleet which will boost Scotland’s transport system by adding more than 9,000 passenger seats to the rail network. "This £24 million investment, which will see around forty new construction jobs created for the duration of the building project, is great news for Glasgow and Scotland. "The Shields Road depot, one of four major engineering depots in Scotland, is set to expand over the coming months to accommodate the new fleet of Class 380 electric trains due to come into service in autumn next year. These trains will be at the cutting edge of rail technology and will deliver real benefits for passengers through improved facilities and 9000 additional seats. "With the planned depot expansion comes a raft of new jobs for the construction industry and I’m particularly heartened during the challenges of the current economic climate to be able to announce these jobs for Glasgow. These are in addition to the 130 plus new permanent jobs that ScotRail expect to create to operate and maintain the new trains from this depot site." "It’s also great news for rail commuters. Once construction of the depot is completed and the new fleet is housed at the expanded depot facilities, the extra trains will enhance services in the west of Scotland by providing extra capacity on Ayrshire, Inverclyde and Renfrewshire routes." "We’re delighted that ScotRail has chosen Siemens to deliver the new, state-of-the-art depot facilities. A key consideration when constructing the new depot is to minimise any environmental impact and maximise energy efficiency with innovative lighting and building materials. The depot enhancements servicing the new Siemens 380 trains will go a long way towards guaranteeing the very high levels of service that our customers and the travelling public expect." 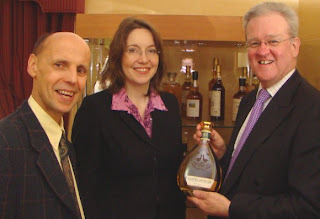 SNP Westminster candidate for Banff & Buchan Eilidh Whiteford has hailed progress made by local MP Alex Salmond and the Scottish Government trade mission to China in securing Geographic Indication of Origin Status for Scotch Whisky. The news was particularly welcome as Eilidh Whiteford accompanied by local MSP Stewart Stevenson were visiting the recently-re-opened Glenglassaugh Distillery at Portsoy. The MSP and SNP candidate met with Managing Director Stuart Nickerson and were given a tour of the distillery. “This is absolutely fantastic news for the Scottish whisky industry and there is no better place to highlight this achievement than at Glenglassaugh Distillery which re-opened last year after being mothballed for 20 years. I was very impressed with what Stuart Nickerson and his team have achieved there and I wish them every success with their plans for the future. “The whisky sector is a key part of the Banffshire economy both in export, earnings and employment terms, and swift progress on the Geographical Indication of Origin issue will be music to the ears of the industry. “Securing Geographic Indication of Origin Status has been a vital issue for the industry, and the progress between the Scottish and Chinese Governments presents important commercial opportunities for Scotland." “More than ever, in these tough economic times, it is crucial that we secure the best trading arrangements for one of our premium products, and to secure such a tremendous outcome in the massive Chinese market could not be better. “It is no secret that the whisky industry has been dealt a blow from the London Treasury’s chaotic changes to the tax regime over recent years, but the Scottish Government’s success in China is great news for jobs, investment and competitiveness. Britain’s last remaining single track trunk road, the ‘Road to the Isles’, has been upgraded to double carriageway standard following a £23 million investment, Transport Minister Stewart Stevenson announced today. Mr Stevenson said that in many ways the completion of the upgrade to the A830 marked the end of an era for a road which has been famed for many years for its single track status. However, he said that the upgrade would be widely welcomed, bringing vital safety improvements whilst boosting the Highlands economy. During a visit to site today, Mr Stevenson also reaffirmed the commitment of the Scottish Government and Highland Council to upgrade another key artery for the Highlands – the A82. Mr Stevenson said that the Scottish Government’s transport blueprint had marked this a priority for the Scottish Government, with £90 million of investment identified as part of the Strategic Transport Projects Review. “The Road to the Small Isles is one of the most stunning in Scotland, with unrivalled views which showcase some of the best scenery anywhere in the Highlands. For years, the road has been famed for its single track status, and in many ways this is the end of an era. However, anyone who has ever experienced the road, will know that this is vital investment which will be welcomed by the local community, visitors and businesses alike. “This investment will deliver important safety improvements and boost the local economy. “During this the year of Homecoming, when we are encouraging people to celebrate Scotland’s culture and heritage, this project will bring real benefits by speeding up journey times, promoting safety and providing better links with Mallaig’s ferry connections to Skye and improving the routes to market for the local fishing industry. ”As a Government, we remain committed to maintaining and improving lifeline routes in the Highland and throughout Scotland. Like the A830, the A82 is a key transport artery for the Highlands and the Scottish Government and Highlands Council are absolutely committed to investing in upgrading this route on a continuing and progressive basis. We have marked the A82 as key priority in our transport blueprint for Scotland, with £90 million of investment identified for the A82 in the Strategic Transport Projects Review. During the A830 project, an additional £239,000 was invested in the construction of two new lay-bys to give road users the opportunity to stop to enjoy the breath-taking views on one of Scotland’s most scenic routes. Some of that scenery meant special consideration had to be given to environmental factors during the design and construction phases. As the road passes through Glen Beasdale Special Area of Conservation, noted for its ancient oakwood, its otters and its fresh water mussels, significant effort was made to retain the existing character of the area. Furthermore, a new habitat is currently being developed to maintain and improve oak woodland. “We are proud of the quality of work we have produced at Arisaig and the way the new road blends into the natural beauty of its surroundings. “The A830 was one of the most frustrating roads for the travelling public in the region and we thank road users and local residents for their patience and understanding whilst the road was being upgraded. 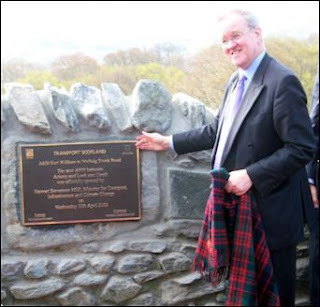 He paid tribute to the campaigning of former local Highland Councillor, Charlie King, Mallaig, in securing Scottish Government support for the Road to the Isles. Bricks and mortar from Glasgow’s past are being recycled in the construction of the M74 Completion project. Rubble from a number of areas of Glasgow including demolished flats in the Gorbals are being used in the construction of the new 8 kilometre stretch of the motorway currently being constructed between Carmyle and the M8 at the Kingston Bridge. The two 23 storey blocks of flats in Stirlingfaulds Place were demolished last year after 35 years providing homes for local people. The material will now take on a new role used as fill in the building of embankments along the route of the vital new transport link for the West of Scotland. Over 500,000 tonnes of aggregate will be recycled with material also coming from the Sighthill and Royston areas of Glasgow and the former Hoover factory in Cambuslang, a well-known local landmark which once covered one million square feet of the town and which will now form part of the new road on the outskirts of Cambuslang. “With construction and demolition waste making up around half of all controlled waste in Scotland, I am delighted to see the innovative practices being implemented on the M74 project. Upon completion, the M74 will open up opportunities, ease congestion and bring economic benefits to the West of Scotland and it’s fitting that part of the old Glasgow will help shape its economic future. The use of recycled or reclaimed aggregate is highly sustainable and prevents virgin material being quarried. The practice is covered by a nationally adopted protocol in which the Scottish Government and SEPA are key stakeholders and all materials are subject to chemical analysis to confirm their environmental suitability before they can be used within embankments across the route. The reuse of these materials is just one of a number of initiatives being undertaken by the contractor, Interlink M74 Joint Venture, to mitigate the environmental impacts of the construction of the M74 Completion which stretches from Fullarton Road Junction near Carmyle to the M8 west of the Kingston Bridge. With several processes in place to minimise waste and maximise reuse covering materials such as aluminium, plastic and paper, 80% of the 1,200 tonnes of waste produced by the project to date has been recycled. “We take environmental matters very seriously on the project and we are governed by assurances made to the public in the Environmental Statement. Our objective is to take the lead in environmental compliance and promote a sustainable approach in all of our activities. The project’s sustainability achievements have been recognised by the awarding of full points for environmental performance by the Considerate Constructors Scheme, a national programme which monitors companies against a code of best practice beyond statutory requirements. Banff & Buchan MSP Stewart Stevenson has welcomed the announcement of Scottish Government plans to extend the availability of civil legal aid from people with a disposable income under £10,306 to those under £25,000. This will make an additional 1 million Scots eligible to receive legal aid, an increase from 43% of the population to 74%. The rest of any case costs would be met through legal aid payments. “This is an important move in these difficult economic times as people unfortunately find themselves facing repossession and in need of legal representation that can be extremely difficult to afford. “By extending the provision of legal aid in such cases, the Scottish Government is providing an important extra layer of protection for people struggling with the downturn. “The previous system prevented people on what were relatively modest incomes from pursuing costly legal action and I am glad that this situation is being brought to an end. Justice should be available to all, and I am sure people in Banff & Buchan will join me in welcoming any measure that helps to ensure this”. Banff & Buchan MSP Stewart Stevenson has welcomed an additional £40 million that will be invested in free personal care, ending a funding shortfall that has been in place since the programme was introduced in 2002. Around 9,600 residents in care homes currently receive personal care payments, with around 6,200 of these also receiving nursing care payments. Around 42,400 people are benefiting from free personal care at home. “The provision of free personal care is vital to a significant number of people in Banff & Buchan and I welcome the fact that the historic shortfall in funding that has existed since the policy’s introduction has now been addressed. “Scotland's Free Personal Care policy is rightly respected and admired for providing real support and benefit to some of our more vulnerable older people. The universal nature of the Free Personal and Nursing Care policy was always intended to ensure that care is provided on a fair and equitable basis but it is important that there are sufficient resources in place to allow free personal care to continue to be a success. Banff & Buchan MSP Stewart Stevenson has welcomed the release of more details on how the Town Centre Regeneration Fund approved as part of the budget process will operate. The £60 million scheme will be open to a range of bodies including local authorities, Community Planning Partnerships, Business Improvement Districts, Town Centre Managers, local Chambers of Commerce, businesses and third sector groups. “Our high streets are the heart of Banff & Buchan’s towns and I am delighted that more progress has been made towards ensuring they have a bright future at the centre of our communities. “The SNP Government is continuing to take action to protect our local communities from the effects of the downturn. Along with the small business bonus, this scheme will help ensure that town centres in Banff & Buchan are able to survive the current problems and retain their important place in everyday life. “I am hopeful that we will see several successful bids from organisations in Banff & Buchan and that this will have a real impact on the future of towns in the area”. Banff & Buchan MSP Stewart Stevenson has welcomed the fact that as of today (April 1st) residents of Banff & Buchan will save money on a range of bills thanks to SNP Government action. The latest phase of prescription charge reductions will lower prices to £4 for a single item, £13 for a 4 month pre-payment certificate and £38 for a 12 month pre-payment certificate. These charges will continue to fall ahead of their complete abolition in 2011, in contrast to the situation south of the border where they have continued to rise. Around 120,000 businesses across Scotland will see their business rates abolished, while another 30,000 will see them lowered significantly. This will provide much needed assistance to small businesses during the current downturn. The latest freeze in council tax has also now come into effect. “The first of April sees a whole host of measures taken by the SNP Government come into effect. Prescription charges have been reduced further; many small businesses have had their rates completely abolished and it is the day that the latest council tax freeze comes into effect. “These policies will all help put money back into ordinary people’s pockets and help them through the current downturn. As well as these measures, a range of new targets on health efficiency, action and treatment come into effect; training programmes for unemployed adults will be available after 13-weeks unemployment rather than the previous 26; and new procedures for landlords and creditors to inform councils when reclaiming properties will help address homelessness problems. “The SNP Government is continuing to deliver real benefits to the people of Banff & Buchan and the start of the financial year is a real landmark in their implementation. We are taking real action to make Scotland a better place and help ordinary people through the economic downturn”. Banff & Buchan MSP Stewart Stevenson has welcomed the launch of a £60 million Scottish Government scheme to help first-time buyers get on the property ladder through a shared-equity scheme. The Open Market Shared Equity pilot scheme had previously operated in 10 of Scotland’s councils, but will now be expanded to cover the entire nation. The increased budget of £60 million is expected to help 1,500 households onto the property ladder in its first year of operation. The scheme is part of the Scottish Government's Low-cost Initiative for First Time Buyers, to help people on low to moderate incomes buy an affordable home where that is sustainable for them. Through the Open Market scheme, buyers can own a home, but only pay for a proportion of it - between 60 and 80 per cent of its value - with the Government funding the remainder through taking an interest-free equity stake. The buyer does not pay any charges on the equity stake, but pays the Scottish Government a proportion of the sale price at the time of sale, or earlier if they wish. “The start of this scheme is excellent news for residents of Banff & Buchan who have previously struggled to get their foot on the property ladder. It will also benefit people who are struggling to sell their properties by stimulating property sales across the market as people are able to move up the ladder. “While purchasing a property is not the right option for everybody, it is important that there is adequate support for those who are trying to but are being priced out of the market. “I would hope that this will help stimulate more activity in the Banff & Buchan property market and provide a boost to the local economy. The SNP Government is determined to help families struggling with the downturn and along with other initiatives, I believe that this scheme will help to do just that”.